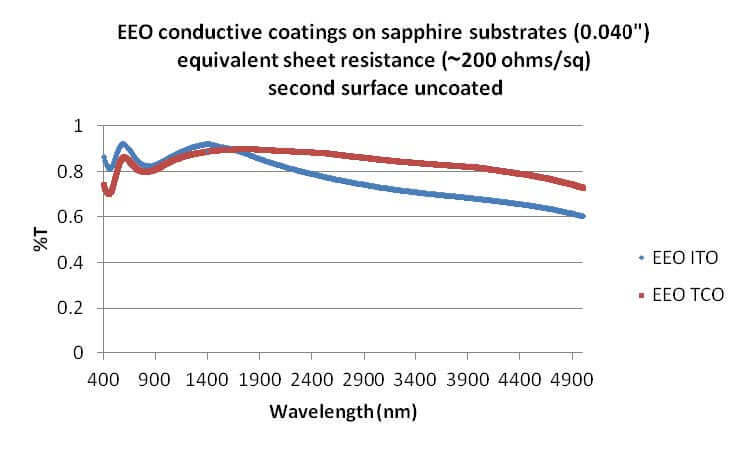 II-VI is Pleased to Announce Transparent Conductive Oxide Coatings (TCO) for the 3-5 micron Region. II-VI internal research and development efforts have result-ed in a pair of TCO coating designs that combine anti-reflection performance with elec-trical conductivity. Conventional ITO—provides mid to low sheet resistance values in the visible and near IR region. Example curves for transmission vs. wavelength are shown on the following page for samples at normal incidence, second surface uncoated. There is a marked improvement in transmission for the LWOS TCO at 3-5μm compared to conventional ITO coating with the same conductivity. II-VI is able to prove design variations of this coating to meet custom applications as well. Transmission performance of the window will be improved and can be optimized for specific wavebands by AR coating the second surface.